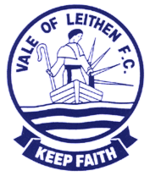 Vale of Leithen Football Club were formed in May 1891, making them one of the oldest football clubs in the Scottish Borders. Selkirk Football Club had been formed in 1880, and Berwick Rangers and Duns the following year. The brothers R and W Hume, originally from Selkirk, were the main protagonists in the founding of the club. The club became full members of the Scottish Football Association in 1897 and have remained so ever since, apart from a brief spell in Junior Football in the 1920’s. They are members of the East of Scotland Football Association and in 2013 joined the Scottish Lowland League, the level directly below the Scottish Football League, and each year participate in the Scottish FA Cup. The club are based in Innerleithen, 6 miles east of Peebles and 12 miles west of Galashiels. With a population of around 2,500 it is the eighth largest settlement in the Borders, and is situated at the junction of the Leithen Water and the River Tweed in the eastern part of Tweeddale formerly known as Peeblesshire. The club found a home at Caddon Park, opposite the old slaughterhouse and played their first two games as ‘Leithen Vale’, but thereafter changed their name to ‘Vale of Leithen Football Club.’ The reason why the club opted for this choice of name is obscure, but ‘Vale’ means valley and Leithen Valley has long been referred to as the Vale of Leithen in local publications. In 1922 Vale moved to their present home at Victoria Park, Hall Street. In August 1974 the old pavilion, which was situated at the east end of the ground, was completely destroyed by fire and in the process the club, as well as losing equipment, sadly lost irreplaceable club records. Vale of Leithen play in the colours of navy blue and white, the reason for which is again obscure. The civic colours of Innerleithen are light blue and white and in old pictures from the 1890’s Vale players appear to be wearing light blue shirts, but by the 1900’s they were clad in the now familiar navy blue. A third colour, red, has also featured throughout the years on socks and as a trim. It is also the colour of Vale’s change strip. In sporting terms Innerleithen’s traditional enthusiasm for football is something of an anomaly in the rugby dominated Scottish Borders. Innerleithen did send a rugby team to the earliest editions of the oldest and most famous Rugby Sevens tournament at Melrose, but the sad deaths of two rugby players convinced locals that it might be safer to play soccer. However, in the early part of last century, several players turned out for both Vale and for nearby Walkerburn Rugby Club. During the 1920’s the enthusiasm for football was such that Innerleithen had five teams; Vale, Vale reserves, St Ronan’s Thistle, Leithen Rovers and Innerleithen Bluebell. Nowadays only Vale and Leithen Rovers remain, joined by Leithen Vale Sports Club, which fields teams of various age groups. The club crest, reproduced in our website banner, features the figure of St Ronan in his boat, to depict the sojourn through life. St Ronan is a major figure in the folklore of Innerleithen and surrounding area, with street names, local landmarks, a school, a silver band and a hotel/bar named after him, while his legend features heavily during the annual summer festival. St Ronan is said to protect Innerleithen from the devil and uses the crook in his left hand to ‘cleik’ (catch) him. In his right hand he holds a lantern to show him the way. As well as featuring the club name, the crest also features the club motto, ‘Keep Faith’.